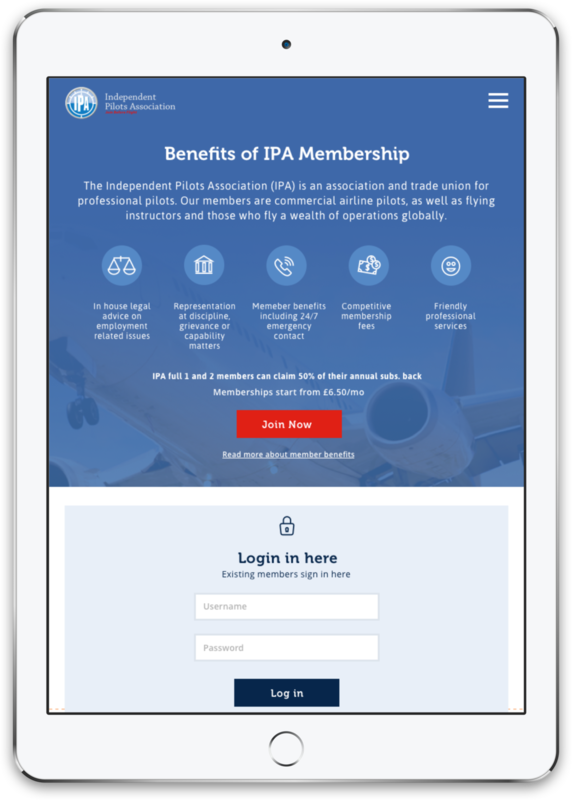 The Independent Pilots Association wanted a new website to improve their members engagement and user experience, making content accessible on many devices. The website needed to handle the membership sign up process and integrate with their existing desktop application which connects to Microsoft Azure, to sync membership information. Another reason for redeveloping the site, was the need to add various information and news, in house and regularly, so Drupal seemed to be a perfect fit. Independent Pilots Association were already utilising Social Media platforms such as Facebook, Twitter and LinkedIn but felt they needed some guidance on growing followers and engagement. They wanted include useful member news within these channels as well as providing new and relevant news to prospective clients but felt that they didn't necessarily have the time or the expertise to do so, regularly. They also needed to increase their visibility within Google, therefore an SEO campaign was also agreed upon. We designed and developed a modern, fully responsive website that allows users to sign up to become members and access member exclusive content. The website also integrates with their desktop application through a RESTful API, using Azure Logic Apps. To improve visibility of their social media presence, we also included an integration with Juicer, to allow all of IPA’s social posts to be combined into a single feed within the website. As members need to sign up and pay for their various memberships within the site, we built a bespoke check out process using Drupal Commerce which uses the payment gateway Sagepay. Integrating Sagepay has allowed members to access their exclusive membership content and news immediately, due to the whole process being dealt with online. Before we undertook their Social Media requirements, we completed thorough competitor research and analysis that included agreeing on the most suitable hashtags that would be used across the platforms to increase brand awareness. The IPA was also keen on making the most of Facebook's targeted, paid ads so we included the creation and monitoring of these within the strategy using the agreed budget. Throughout the campaign we have conducted various regular site audits, to gain information on where SEO improvements can be made, some of which have included image optimisation and meta description updates. The result is a fully responsive, modern website that allows members to easily signup and view their exclusive content. Referral sessions from Twitter have increased by 113.79% through regular, interesting posts and updates. Through our paid Facebook ad work, there has been an increase by 612.50% in referral sessions and 650.00% in new users. Through our SEO authority work, we have seen a number of keywords increase in rankings within Google, including ‘airline pilots union’ which has increased by 36.8% to position 7.4.